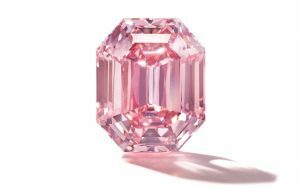 In just three weeks, On November 13, 2018, Chrisite’s will be offering its largest Fancy vivid Pink Diamond ever offered at auction. 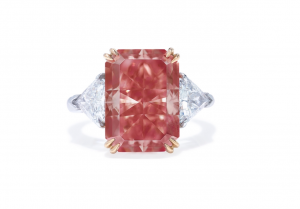 The 18.96 carat, Fancy Vivid Pink, also known as “The Pink Legacy”, was previously owned by the Oppenheimer family. The auction house will also feature several other unique and rare Fancy Color Diamonds. Let’s look at some of the unique items that will be offered, starting by the order of offering. 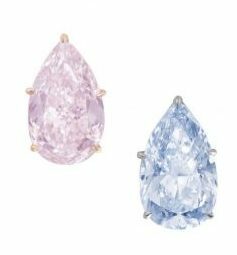 A pair of beautiful Pink and blue diamonds earrings are quite unique. The 8.79 carat, Fancy Orangy Pink Diamond, pear shape with a VVS2 clarity is offered with the 8.85 carat, Fancy Blue Diamond with a VS2 clarity. The blue diamond is a type IIb, while the pink is type IIa. The pair is valued at $4 million to $6 million. The only thing we need to remember for now, is that due to the fact that the pink diamond has an orangy secondary tone to it, its value is approximately half of a similar but straight Fancy Pink Diamond. The pair have been previously offered at auction. It was in May 2016, that they were sold at a Sotheby’s auction in Geneva. They were sold for a total of $5,989,523. Back then, they were valued at between $1.97 million to $2.95 million, or about half of their current estimate. I really wonder how they will be sold and for what amount. I also wonder what are the circumstances surrounding their sale. Let’s wait and see. A 7.58 carat, Fancy Bluish Green with a VS1 clarity is being offered. It has a unique shape; round-cornered square cut. It is valued at $1 million to $1.5 million or $132k to 198k per carat. The closest item that sold at auction was a 3.05 carat Fancy Blue-Green VS2 sold a year ago. Although this is a bluish green, its value could be higher as the secondary tone is lighter, yet it may be more attractive to the eye. Let’s see what happens at the auction. This 8.25 carat, Fancy Deep Orangy Pink with a VVS1 clarity is extraordinary. The only other Fancy Deep pink ever offered at auction was actually a 1.07 Fancy Deep Purplish Pink back in april 2017. This diamond is valued at between $2.7 million to $3.5 million or 327k to $424k per carat. I believe that there will be a real “war” between bidders to win this one, and it may actually be considered the star of the evening to some. Why? Think Upgrade! Not very often do we get to see a large Yellow diamond in the shape of a briolette. 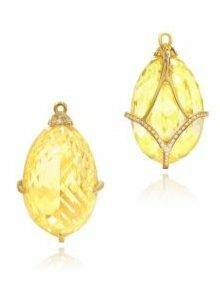 This 81.40 carat, Fancy Intense Yellow diamond in a Briolette shape with a VS2 clarity is offered at $1.8 million to $2.5 million total or $22k to $31k per carat. what makes this shape so desired? 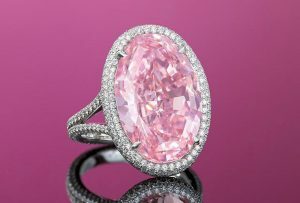 The star of the auction is the 18.96 carat, Fancy Vivid Pink diamond with a VS1 clarity; “The Pink Legacy”. It has been cut in the traditional Emerald cut. It is the largest Vivid Pink ever offered by Christie’s. It is valued at between $30 million to $50 million or $1.58 million to $2.64 million per carat. It was once owned by the Oppenheimer family, yet it is promoted as “The Property of a lady”. I am just slightly disappointed that it has a VS1 clarity. It is also noted by the GIA that it is a Type IIa and its origin is South Africa, which is quite important to collectors and investors. 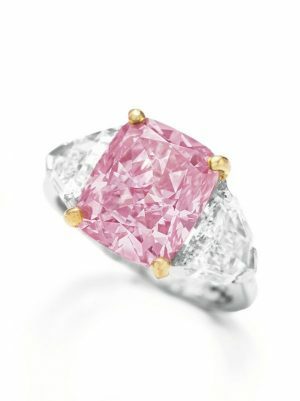 The highest price per carat ever paid for a pink diamond was $2.175 million per carat for “The Pink Promise” which was sold in November 2017 in Hong Kong at Christie’s as well. It was a 14.93 carat Fancy Vivid Pink with a VVS1 clarity. Prior to that the highest price per carat was held since 2009 when the 5.00 carat Fancy Vivid Pink with a VS1 clarity was sold for the staggering (back then) $2.155 million per carat. Several large and rare colorless diamond will also be offered at the geneva auction. If it was not for “ The pink Legacy” being offered, the auction would not have been so exciting in my opinion. It only goes to show that rare items are extremely hard to come by and that auction houses have to take extraordinary measures in order to ensure these rarities are offered at the auction.